There are few vacations as exhilarating as an adventure fishing trip. More than just a trip to your local fishing hole, these riverboat fishing expeditions will take you up and down exotic rivers, along distant coasts, and to hidden fishing holes to find the most elusive of game. For the avid angler, an adventure fishing trip can truly be the experience of a lifetime. Finding the right outfitter, however, can also feel like it takes a lifetime. There’s no need to struggle to find the right fishing outfitter for your next adventure when you follow these simple steps. Weather and river conditions vary from place to place and around the year. While summers might be hot and muggy along a river in some places, it might be cold and crisp in other places. Similarly, water levels fluctuate throughout the year, and in response to winter snowpack and spring snowmelt. While you’ll want to challenge yourself during your adventure, you don’t want the weather and water to keep you from enjoying your trip. Find a location that meets your temperature tolerances, and make sure that the area’s rivers are going to have enough water to house plenty of fish. 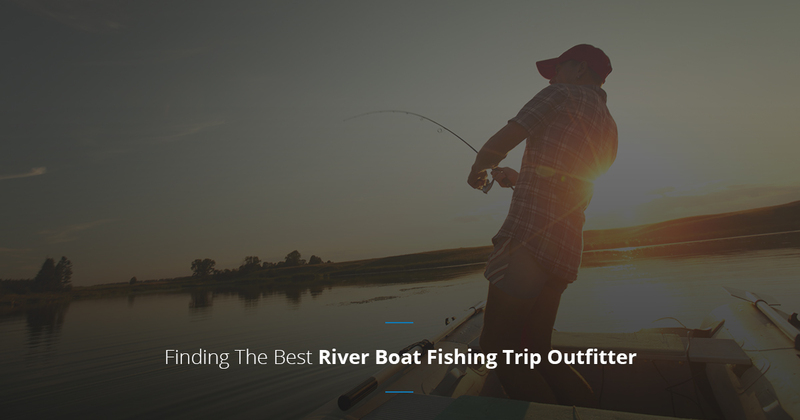 Generally, riverboat fishing trips run from a half-day to more than a week. You’ll want to choose a trip length that satisfies your need for adventure and desire to catch fish but doesn’t leave you feeling bored and restless by the end of it. You should also consider how long you’re willing to spend camping or lodging in unfamiliar places. You’ll want to make sure that any friends and family that are coming with will share your enthusiasm for however long you choose to go. For every experienced river runner, there is an equal number of amateurs. You’ll want to make sure you’re working with an experienced outfitter. They’ll have an unrivaled familiarity with the rivers you’re exploring, showing you the best places to fish. More importantly, of course, they’ll be able to help you safely navigate your way along the river. You can gauge an outfitter’s experience by asking how many trips they run in a year, and how often. Ask about their first aid training, their use of safety gear like life jackets, and finally, ask about their liability coverage. An experienced outfitter will be able to give you clear, concise answers to all of these questions. You can travel in confidence with these guides. More than just the promise of fish, most riverboat fishing expeditions include a variety of other amenities. For some, it’s camping supplies and equipment. Others it’s a meal schedule and free beverages. Still others might include stops at historic sites or spectacular natural areas. Find out what each tour offers beyond fishing to make sure you find an experience that’s right for you. Led by Kurt Killgore, Killgore Adventures offers the finest in adventure fishing and jet boat tours of Hells Canyon, Idaho. They run hundreds of trips up and down the Salmon and Snake rivers in exclusive jet boats every year. Killgore Adventures is excited to help folks explore this natural wonder and catch incredible fish, like the sturgeon.